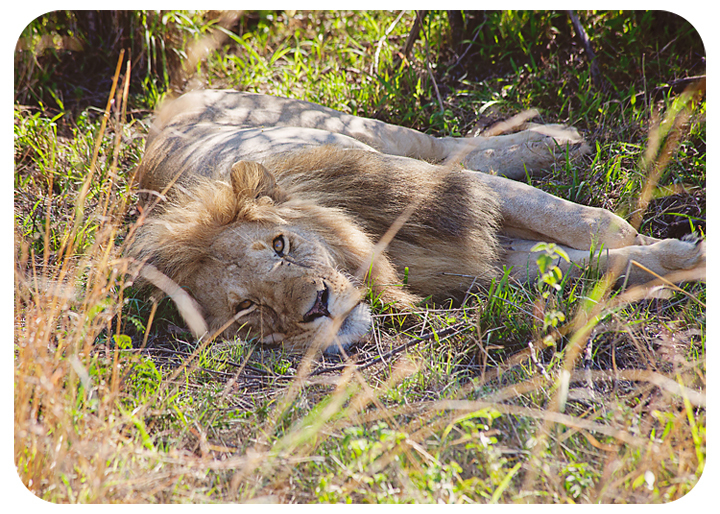 Here’s another fat, happy lion sleeping in the shade…we kept the engine running as we watched him dose. 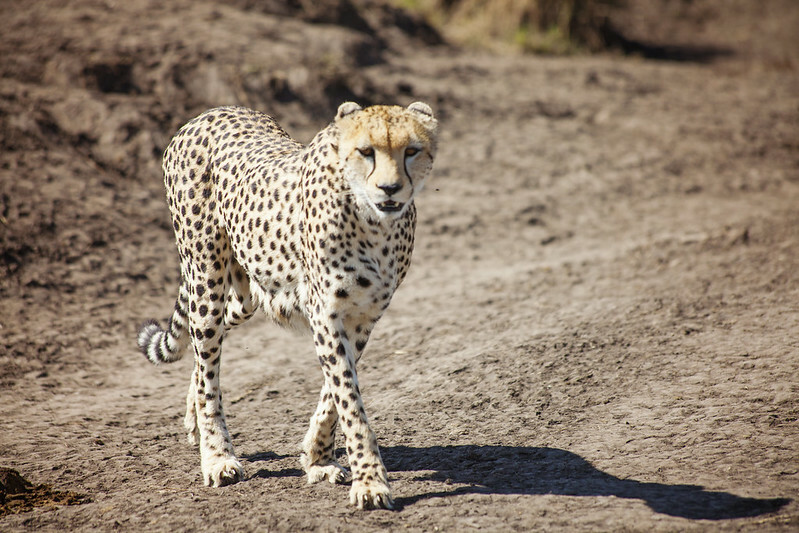 A beautiful cheetah walked right in front of our van. She walked down the road and planted herself up on a little hill for everyone to take pictures. 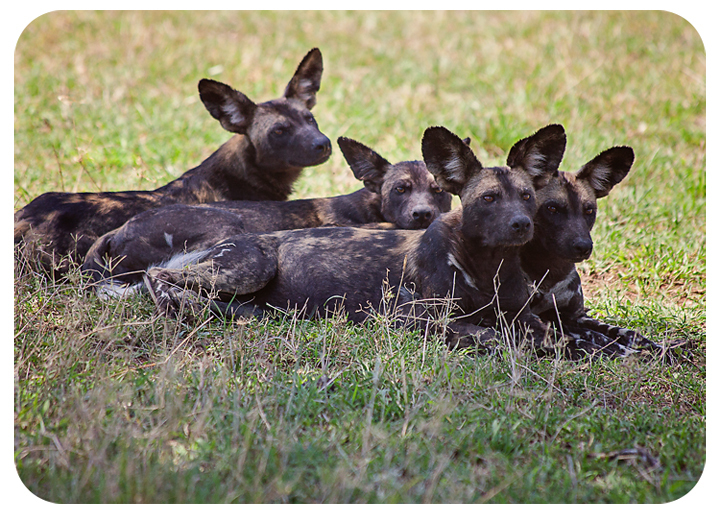 We were extremely fortunate to come across four hunting dogs lounging under a tree. 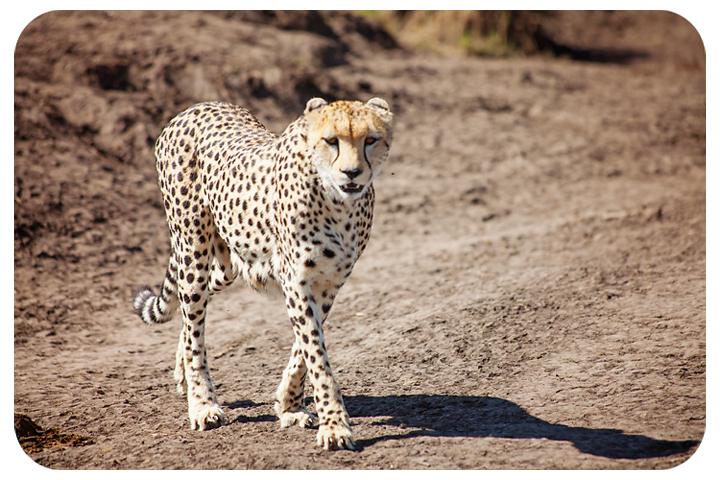 Our guide had not seen them in Masai Mara in 19 years. As we pulled up to hunting dog tree our guide forgot about our dead battery and turned the engine off. Oops. There we were in front of these cute, vicious, wild dogs and no one was going to get out and push. Our friend, Julio, said “Sowa Sowa, Tony” and we all laughed because this is what you say to the guide when you are ready to go and we all knew we weren’t going anywhere! Thankfully the other van in our group rescued us by lining up his van nose to nose to ours and pushing us back up a hill where we preceded to roll past the hunting dogs as the engine came to life. There was a lot of action at the river. 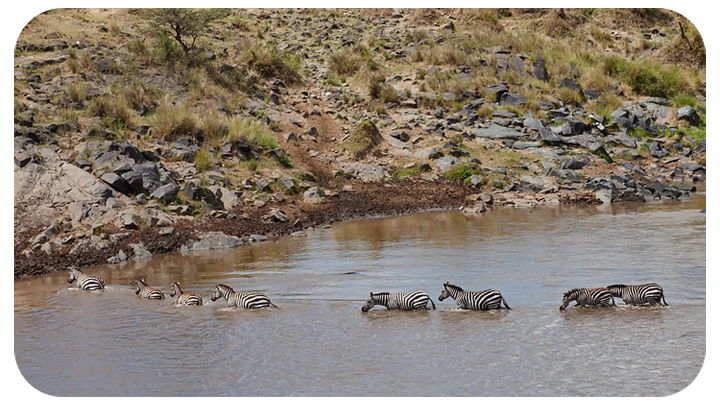 Groups of zebra were cautiously crossing the crocodile river. At one point they pulled the whole group back and sure enough…. 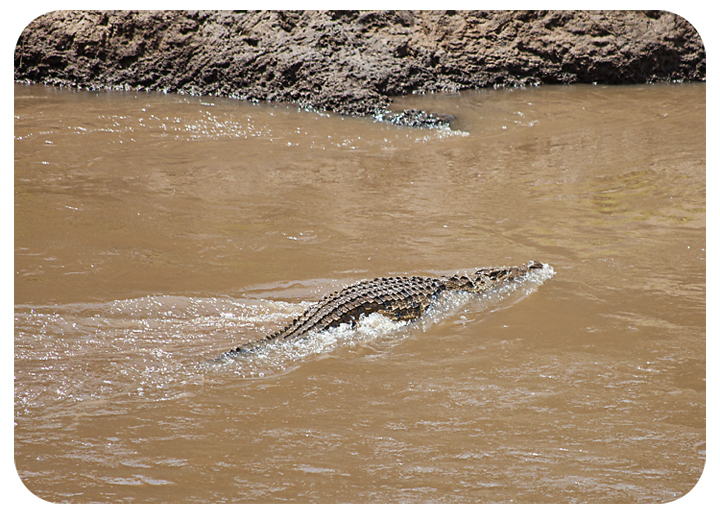 This crocodile was swimming upstream. We also saw lots of hippo in the water. The groups of hippo looked like groups of big rocks. 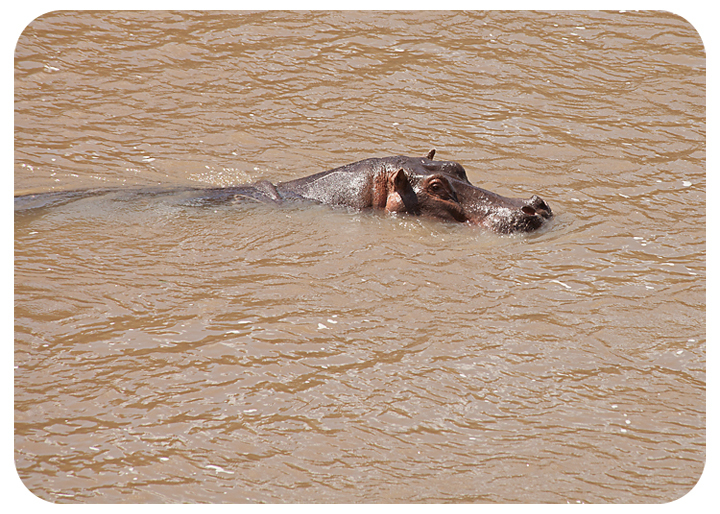 This hippo was having a little swim. 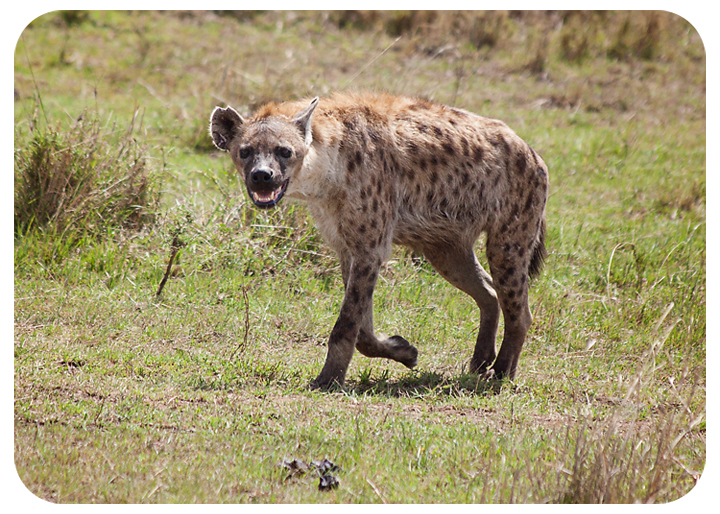 This hyena also walked right by our van with two of his friends. 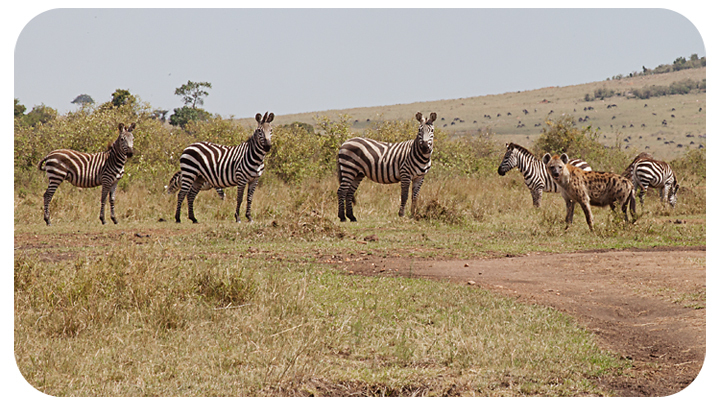 He proceeded to walk by a herd of alert zebra….I like how they all turned and posed for my picture! Beautiful Masai giraffe as we headed out of the park on the 2nd day. 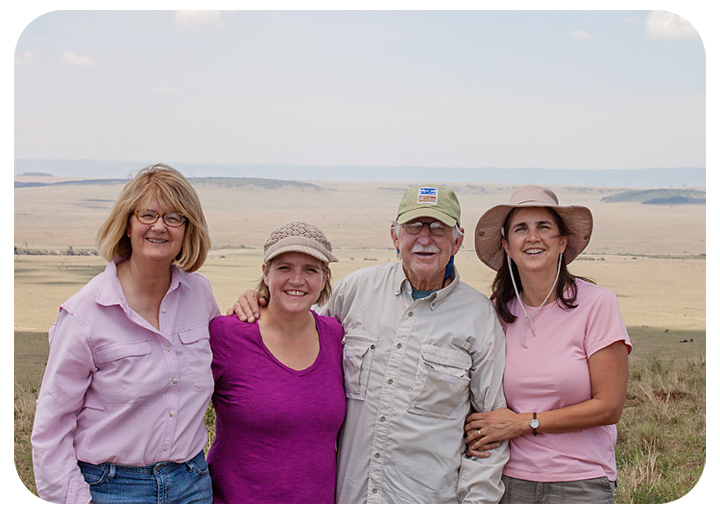 One picture I have to include is from our nature walk around our Masai Mara hotel. 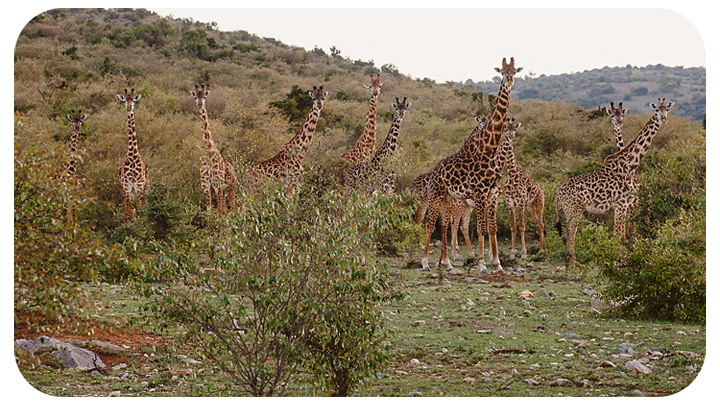 We ran into a herd of 20 giraffe while on foot. They were as curious about us as we were about them! Thanks for tuning in for my African adventures! We did have a fabulous trip! Really appreciate your sharing the adventure.